Photoshop Tutorial - What is the RAW File Format? Photoshop Tutorial – What is RAW File Format? This Adobe Photoshop Tutorial Video is going into detail about what is so good about the RAW File Format. When you shoot, the picture taken by your DSLR Camera is stored in the RAW File Format, which essentially keeps your image quality exactly as the camera sees it. The Raw file is made up of ones and zeroes that your computer can process. If you know little about the Raw File Format, then you will soon discover why professionals use it… exclusively. Previously, we talked about the JPG and its ability to compress your images into smaller file sizes by grouping similar colors together. We mentioned that upon zooming in on your saved JPG picture, you would notice boxes of color called pixels. These pixels are pre-assigned shades of color that are made up of Red, Green, and Blue (RGB) that make up approximately 16.7 Million Colors. Unfortunately, many colors otherwise possible, are stripped away due to the JPG Compression. In a RAW File, color information is not stored in compressed predefined pixels, but as values of ones and zeroes that equal approximately 68.7 Billion Colors. And because the possibilities for its combinations are practically endless, a RAW File stays true to the quality of your photo exactly as how the camera originally saw it. Like we said, even after zooming in, you can see that your pictures suffer no losses on quality because each individual hue is better represented. The power of those ones and zeroes is amazing, don’t you think? Lets assume you have a white wall. If you want to make it red, you get some red paint, and cover the wall. You can never get back to the original, white wall. You would need to get white paint, and paint back over the top. Now you have a white wall, with dried red paint, and then white paint over the top of that. By adding the paint strokes, you have damaged the wall. This is what it is like, working with pixels. However, what if you could start with that white wall, but illuminate it with a red light? The wall is still white, it only looks red. There are not brush strokes, and we can get back to where we started, just by turning off the light. This is more how Camera Raw works. It’s only when we are finsihed with all our color and tonal corrections, that it creates a pixel based image. As mentioned, a RAW file stores color information via values of ones and zeroes. This means that despite seeing pixels on your screen, when you edit or manipulate the photo, you in no way can “damage” or the quality of the photo. The colors are not stored in the pixels; they are merely displayed that way. Bit Depth is the number of possible colors displayed per pixel, in Red, Green, and Blue (RGB). JPGs use 8-Bit Bit-Depth which is 16.7 Million Colors. Raw Files from your Camera often uses 12-Bit Bit-Depth which is 68.7 Billion Colors. Camera Raw and Photoshop uses 16-Bit Bit Depth which is 281 Trillion Colors. Many HDR programs (including parts of Photoshop) use 32-Bit Bit Depth for a total of…. Oh, you get the idea. Since humans can only see about 10 million colors, isn’t all this overkill? Some would argue yes. However, just because we can not see all the colors, does not mean they are not there. At the end of the day, if we can create a smoother transition from one color shade to the next, then the least chance to see banding or other artifacts in that brilliant sunset. Let’s shake off those numbers for a while and move on with another thing about Camera Raw, Lightroom, and Raw Processors in general. It’s important to note that they work with a color profile called ProPhoto, and this baby has an impressive arsenal of colors at its disposal compared to any other color profile. Digital displays like monitors, smartphones, projectors, TVs, etc; all commonly use a color space called sRGB. Beyond that, a wider color space called Adobe RGB supports many more possible colors. Even further than that is ProPhoto, which covers the color we can see, and even ones we can not. While most displays and devices are not be able to handle that much color information, what it does mean is that because Camera Raw is working with ProPhoto, it can handle an extremely high quality photos without any color loss as you are manipulating all the colors and tones. We talked a big game about the RAW File, and it got all technical with the numbers and the values. But what all these computations show is that a RAW File has an insanely high quality, but it also eats up a lot of memory and space due to its file size. So when using RAW Files, what’s in it for you? Working with RAW Files in Camera Raw or Lightroom (16-bit and with ProPhoto) gives you the widest range of color values to choose from and shows you the cleanest, most high-quality photo from your camera. When you manipulate RAW files in a Raw Processor, it does not group similar colors together. It does not create bands of color, nor does it work with pixels. A DSLR Camera captures an image in 12-bit or 14-bit Bit-Depth. Saving it as a JPG sacrifices its quality, as a JPG brings it down to 8-bit. With Camera Raw, you work with an image as a 16-bit, thus preserving the quality of the original image as your camera takes it. With a RAW File in Camera Raw or Lightroom, you can choose your saving options depending on your needs. You have the option of saving in sRGB, AdobeRGB, or ProPhoto; as well as the option to save in 8-bit or 16-bit. In short, if you really need a high-quality photo and want to show every single color as it was captured by your camera, it’s best to use a RAW File so as not to compromise the smooth transition of those gradients. Also, if you need to blow up a picture as a poster or something, you would want to minimize the bluring or pixelization, so stick with the RAW format. Despite all those technical terms and numbers, that’s all you really need to understand and go by. And now that you know even more about the difference between the JPG and the RAW File Formats, you can snap away on your camera, with more confidence than before. 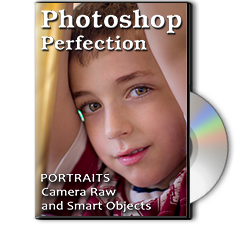 To learn more about our complete 2 Hour Photoshop Class that this video comes from, simply go to Portraits, Camera Raw, and Smart Objects. Change the way you work on your portraits. It’s Free. Enjoy. This Adobe Photoshop Tutorial answers the question: What Are RAWs? If you would like to learn more about Photo Enhancement from a Professional Retoucher, I offer Adobe Photoshop Classes. Please contact me today, and I will be able to add you to the schedule too. If you would just like to watch online videos, The Art of Retouching Studio offers many Photoshop Tutorials for Beginners and Advanced users.